the days when there was a wheelwright on every street corner were likely only recorded in wood engravings printed on one of those fascinating letterpress machines. the bulk of everything that goes round on a bicycle nowadays is assembled and trued by machine providing a technology that is commensurate with everything else in the bicycle industry. this is not to decry the skills of the wheelbuilding artisan; the very best can still produce wheels that are every bit as good as the factory output. however, it cannot be denied that the process of lacing a wheel is less than an art. if truth be told, if you spend long enough every day popping spokes into hub flanges, it could conceivably be described as drudgery. for those of us with the ability to build, but a less than demanding need to do so, it can be almost therapeutic. that is to say, always assuming i don't inadvertantly place the valve hole between a crossing pair of spokes; stripping and rebuilding is when therapy is furthest from my mind. a handbuilt wheel is a thing of beauty, as far as i'm concerned, but that doesn't mean i cannot appreciate the finer points of heart-stoppingly expensive carbon hoops. 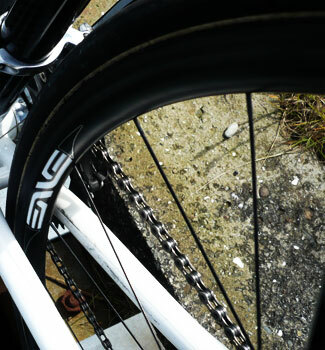 such are enve composite's conservatively named twenty-fives. these are so-called because the rim is 25mm deep. starting life as edge composites, but morphing to enve for european trademark issues, they have cleverly altered the logo so that you'd almost never notice. one of those 'didn't those used to be called...? situations. the logo has rather swiftly become a badge of honour amongst the cognoscenti; with good reason. rather obviously, wheels require a bicycle just as much as a bicycle requires wheels, and these arrived attached to something special, that will receive its own review within the next week, and shod with vittoria corsa cx tubulars. the hubs, in this particular build were supplied by dtswiss; the two options would appear to be dt 240s and 190s. the test pair utilised the 240s, hubs that i fear may have the loudest and most industrial sounding freewheel ratcheting, but coupled with 'smooth as you like' bearings. i have not yet managed to reconcile the minimal number of spokes employed in 21st century wheels, in comparison to the 36 three cross that used to be the norm only twenty or so years ago. allowing for the immutable laws of physics, and coupled with the spokes on the enves looking thinner than normal, i'm half glad that i can't see the rotating bits when in the saddle. 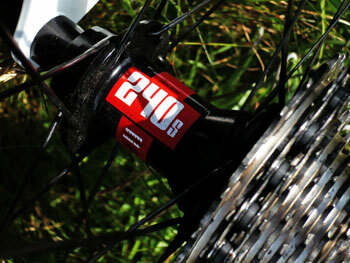 the 25s offer 20 radial spokes up front, and 24 two-cross at the rear. though available with a campagnolo cassette pattern, with the bicycle running sram red, these arrived with the shimano spline pattern that suits both 's' lettered manufacturers. i've ridden several carbon rimmed wheels over the years, most of them featuring more than double the depth of the enves, something that has given genuine cause for concern due to a prevalence of crosswinds round these here parts. a 25mm carbon rim is shallow enough to obviate this problem, yet deep enough to provide the degree of resilience that days of hard riding, crap roads and cattle grids can inflict. add to that a level of comfort that really is most welcome, despite their visual fragility (i still think too few spokes look scary), and the twenty-fives begin to shine before their circumferences have rolled even one centimetre. but let's not kid ourselves; those wheels are designed to cover more than mere centimetres - kilometres even - and that is where all the aesthetics in the world won't save you from losing the wheel in front. though perhaps not as clinical, programmed and scientific as some, i have employed pretty much the same criteria for wheel and bicycle tests for a number of years. factoring in the weather is a bit of a no, no because there's no way of predicting what it might do. however, the law of averages has pretty much decreed that every wheel has its day in the sun, and another in the rain. these particular hoops retail at a modicum under £2,000, and relative hypothetical fragility aside, i'd be more than happy if my two grand was able to go everywhere i'd like to go, and one or two places i'd probably rather not. before we step too much further, tautologically, if a bicycle is going nowhere without wheels, those selfsame wheels are going nowhere without tyres of one kind or another. 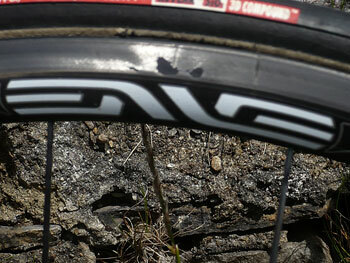 the twenty-fives are tubular only, and as mentioned above, vittoria tubs were fitted to the test pair. 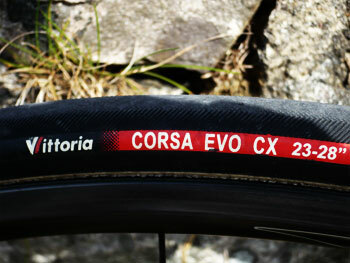 it is almost twenty years since i last rode a pair of vittoria tubulars, and i can but admit that i had completely forgotten just how luxurious corsas can be. despite many conversations to the contrary, and despite many a technological improvement in clincher tyre technology, nothing truly compares to riding tubulars, and these must be amongst the very best in the world. unlike clinchers and tubes which can happily reside in the bikeshed for days or even weeks at a time without an askance look at the nearest track pump, the vittorias encourage, nay demand you implement a daily inflation regime. despite being pumped just past 100psi, by day two both were nearing sixty. think of it as a part of our cycling heritage. the enves were spared nothing: pushed hard (relative term) along uiskentuie strand into a gale force crosswind; punished on many a seriously potholed road, subjected to embarrassingly gravelled downhill corners and made to traverse a complete set of visibly unkempt cattle grids. 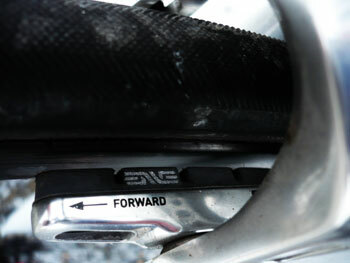 they were ridden on wet roads into driving rain and stopped frequently via their enve branded carbon brake shoes. you won't head over the handlebars with an abrupt stop, but it takes very little time to acquire the knack of judging an appropriate braking distance. wheels can rarely be considered in isolation; the vittorias undoubtedly gave as good as they got, engendering grandiose notions of professionalism while evening out much of the inherent discomfort of islay's roads. it would be naive to exclude the contribution made by the bicycle, but at the risk of putting the cart before the horse, this is what i would describe as a symbiotic relationship. climbing was a pleasure. in fact, if i'm completely honest, it was magnificent. these wheels, as a pair, would trouble a pair of kitchen scales by a tinsy 1038g, which is pretty close to the minimum rotating weight you're like to find anywhere this side of easter island. the experience is dazzling: figure you're tiring and surely about to drop below escape velocity, a swift kick on the pedals must be what it feels like to lift off in an hot air balloon. impressive would be something of an understatement. thankfully these particular examples did not arrive with dtswiss' re-invention of the q/r which ratchet rather than cam and which i'd prefer not to experience anytime soon. rotating exotica all but equals shiny carbon tubes in the how to scare the bank manager stakes. whether such stratospheric expenditure is within your grasp is between you and your bank sort code, but should that be a minor concern on the way to the finest cycling experience money can afford, enve ought to be a serious consideration. as satisfactorily tested in a crosswind with teeth. uphill.